My pregnancy with Hadley got a little rough at the end. I was riddled with pre-eclampsia and was so swollen I had to wear my husbands shoes. With two weeks to go I was put on STRICT bed rest - only getting up to go to the bathroom was permitted. These days I would kill for a little bed rest, but back then it was pure torture. After one week, I was BEGGING Justin to take me somewhere - anywhere - I just had to get out of the house. 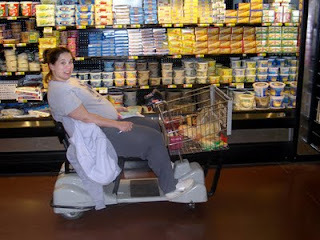 So, we cut a deal - he would "let" me go to the grocery store IF I agreed to ride in a motorized cart. Off we went - hell, I would rock that power chair if it meant I got to leave the house. We went late at night (didn't want anyone to see me!) and I zipped all around that store! Probably the most fun trip to the grocery store I've ever had! This was April 5th, two days before Hadley was born. Happy 6th Birthday to my sweet girl, Hadley June - the only person on the planet I would rock a Hoveround for.